Now in paperback, the updated and expanded edition: David Graeber's "fresh . . . fascinating . . . thought-provoking . 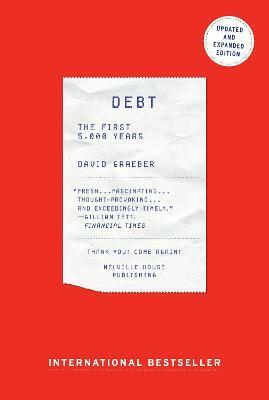 . . and exceedingly timely" (Financial Times) history of debt Here anthropologist David Graeber presents a stunning reversal of conventional wisdom: he shows that before there was money, there was debt. For more than 5,000 years, since the beginnings of the first agrarian empires, humans have used elaborate credit systems to buy and sell goods--that is, long before the invention of coins or cash. It is in this era, Graeber argues, that we also first encounter a society divided into debtors and creditors. Graeber shows that arguments about debt and debt forgiveness have been at the center of political debates from Italy to China, as well as sparking innumerable insurrections. He also brilliantly demonstrates that the language of the ancient works of law and religion (words like "guilt," "sin," and "redemption") derive in large part from ancient debates about debt, and shape even our most basic ideas of right and wrong. We are still fighting these battles today without knowing it. "An alternate history of the rise of money and markets, a sprawling, erudite, provocative work." "[A]n engaging book. Part anthropological history and part provocative political argument, it's a useful corrective to what passes for contemporary conversation about debt and the economy." "Fresh... fascinating... Graeber's book is not just thought-provoking, but also exceedingly timely." "Terrific... In the best anthropological tradition, he helps us reset our everyday ideas by exploring history and other civilizations, then boomeranging back to render our own world strange, and more open to change." "An amazing debut - conversational, pugnacious, propulsive"
"Graeber's book has forced me to completely reevaluate my position on human economics, its history, and its branches of thought. A Marxism without Graeber's anthropology is beginning to feel meaningless to me." "The world of borrowing needs a little demystification, and David Graeber's Debt is a good start." "Controversial and thought-provoking, an excellent book." "This timely and accessible book would appeal to any reader interested in the past and present culture surrounding debt, as well as broad-minded economists." "I consider him the best anthropological theorist of his generation from anywhere in the world." "A brilliant, deeply original political thinker." "If anthropology consists of making the apparently wild thought of others logically compelling in their own cultural settings and intellectually revealing of the human condition, then David Graeber is the consummate anthropologist. Not only does he accomplish this profound feat, he redoubles it by the critical task-now more urgent than ever-of making the possibilities of other people's worlds the basis for understanding our own." Winner of the Bateson Book Prize awarded by the Society for Cultural Anthropology "One of the year's most influential books. Graeber situates the emergence of credit within the rise of class society, the destruction of societies based on 'webs of mutual commitment' and the constantly implied threat of physical violence that lies behind all social relations based on money." --Paul Mason, THE GUARDIAN "The book is more readable and entertaining than I can indicate... It is a meditation on debt, tribute, gifts, religion and the false history of money. Graeber is a scholarly researcher, an activist and a public intellectual. His field is the whole history of social and economic transactions." --Peter Carey, THE OBSERVER "An alternate history of the rise of money and markets, a sprawling, erudite, provocative work." --Drake Bennett, BLOOMBERG BUSINESSWEEK "[A]n engaging book. Part anthropological history and part provocative political argument, it's a useful corrective to what passes for contemporary conversation about debt and the economy." --Gillian Tett, FINANCIAL TIMES (London) "Remarkable." --Giles Fraser, BBC RADIO 4 "Terrific... In the best anthropological tradition, he helps us reset our everyday ideas by exploring history and other civilizations, then boomeranging back to render our own world strange, and more open to change." --Raj Patel, THE GLOBE AND MAIL "An amazing debut - conversational, pugnacious, propulsive"
--TIMES HIGHER EDUCATION (UK) "Graeber's book has forced me to completely reevaluate my position on human economics, its history, and its branches of thought. A Marxism without Graeber's anthropology is beginning to feel meaningless to me." --Charles Mudede, THE STRANGER "The world of borrowing needs a little demystification, and David Graeber's Debt is a good start." --THE L MAGAZINE "Controversial and thought-provoking, an excellent book." --BOOKLIST "This timely and accessible book would appeal to any reader interested in the past and present culture surrounding debt, as well as broad-minded economists." Praise for David Graeber "I consider him the best anthropological theorist of his generation from anywhere in the world." --Rebecca Solnit, author of A Paradise Built in Hell "If anthropology consists of making the apparently wild thought of others logically compelling in their own cultural settings and intellectually revealing of the human condition, then David Graeber is the consummate anthropologist. Not only does he accomplish this profound feat, he redoubles it by the critical task--now more urgent than ever--of making the possibilities of other people's worlds the basis for understanding our own." David Graeber teaches anthropology at the London School of Economics. He has written for Harper's, The Nation, Mute, and The New Left Review. In 2006, he delivered the Malinowski Memorial Lecture at the London School of Economics, an annual talk that honors "outstanding anthropologists who have fundamentally shaped the study of culture." One of the original organizers of Occupy Wall Street, Graeber has been called an "anti-leader of the movement" by Bloomberg Businessweek. The Atlantic wrote that he "has come to represent the Occupy Wall Street message...expressing the group's theory, and its founding principles, in a way that truly elucidated some of the things people have questioned about it."